An ex- Banker with MBA(MS) in Marketing and Finance, she is an adventurous person. 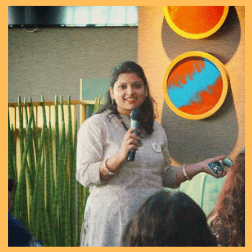 Post-MBA, she started her career with ICICI Lombard into Sales and moved to work with Jasper Infotech and a Designing company as Marketing Manager. She joined State Bank Group as a probationary officer in 2010 and left her glorious career in 2018 to contribute to the training industry. She did her Master Diploma in Train the Trainer along with Master Practitioner NLP. She is working closely with Kotak Education Foundation to train the college students in Life Skills. She has also trained professional in communication skills. Being a soft skill and management Trainer, she conducts all her training in a very action pact way which ensures that every participant is involved throughout. She is an avid reader and has her blog on Facebook by the name reading affair. She has developed modules on Effective listening skills, GOAL setting, Emotional Self Awareness, Time Management amongst others and believes in providing highly customized training solutions. Being a mom, she is proudly associated with UNIMO- Universe of Mom, largest online mommy community as Associate Vice President.